Ripghan von Rainbow. Catchy name, yes? You may come to notice that I rarely come up with my own ideas. It’s true. I’m pretty much a total fraud when it comes to originality. I have none. Zero. Zip. Zilch. I LOVE looking at other creators wonderful ideas that they have been able to make a reality and having a crack at them myself and I will always do my best to credit the person I (erhem) borrowed the idea/pattern/recipe from. 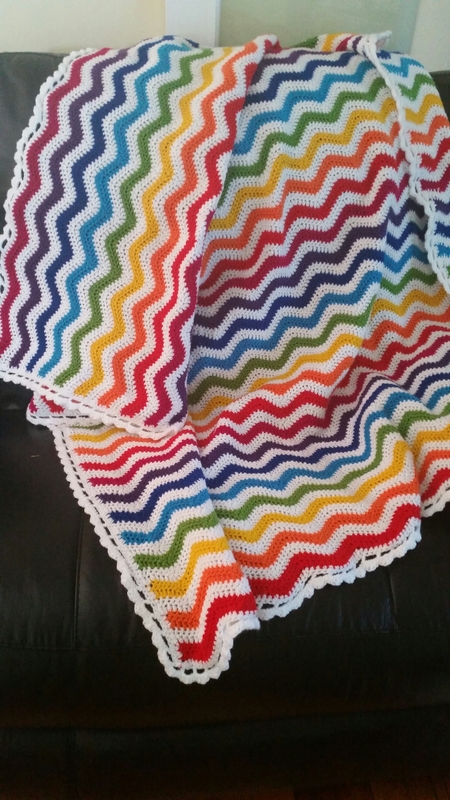 The need to do a rainbow ripple blanket came for me when I was facebook stalking The Patchwork Heart. Heather is everything I want to be in a crocheter (is that even a word?!). I just want to be her. It’s like everytime I see a pattern or a finished item on facey or online, she’s done it or posted about it. I saw that Heather had done a version of Attic24’s Neat Ripple Pattern and I loved it. So I went to my local Spotlight and picked up 2 balls of each colour and 4 balls of white. I had no idea how much I’d need because I hadn’t read the pattern as yet, I just wanted to get started! I started and unpicked quite a number of times. This was my first chevron attempt and it took a while for the pattern to sink in. I’m sure you know the feeling. 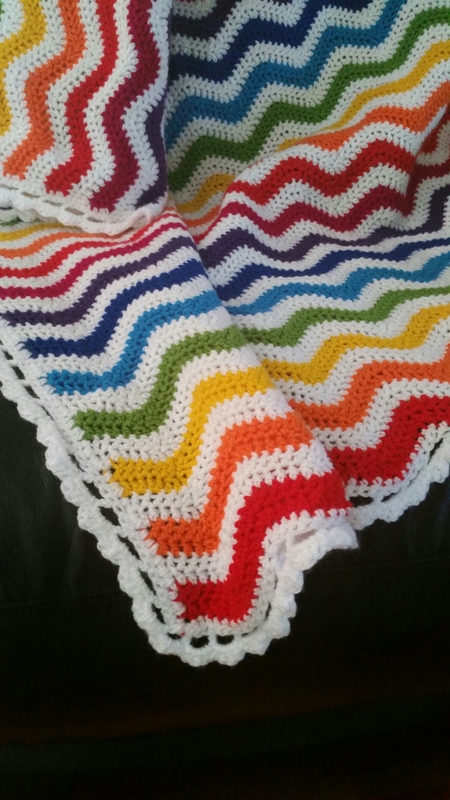 I found that this blanket really came together quickly, probaly because I was changing colours every two rows. I used 4 sets of colours to complete my blanket and it reaches from just under my arms to over my toes. For the boarder, I single crocheted all the way around the outside and then on the second way around I chained 5 into every third sc. On the third way around, in each space I did: single, half double, double, half double & single and that gave me the scalloped edging. Let it be known that I made this up as I went and while I’m sure someone came up with this boarder, I just went with whatever was in my head! All up I estimate it cost me about $30.00 and 20 hours to make this blanket. You could probably knock it over faster if you are able to crochet for longer periods of time but this was a task that I done at the end of each night after the kidlets went to bed.